A while back I got a ZX Vega for the LOLs and trying to remember what the Spectrum was like. Of course, I didn’t need to remember: I have quite a few in watertight boxes in the garage and, of course, I was a BBC Micro fan as a lad. So, after a quick play and realising that 80s resolution on a 42” TV does not look good and that Spectrum artefact clash has always been horrible (thanks to the way that the Speccy did screen memory), I wondered how this thing worked. Obviously, it’s running a Spectrum emulator – my initial guess is that the creators of the Vega wouldn’t have written their own – not when there’s many open source and easily licensed emulators around. As a quick finger-in-the-air estimation, I thought it would probably use some simple Linux like base OS, running a framebuffer menu over the top and probably spawning fuse. After all, that’s how I would do it. When reverse engineering stuff like this you can attack at multiple levels: looking at the software, looking at the hardware or attempting to reverse the firmware. The first step when reversing stuff is to use some binary matching tools, these look for signatures in the data and attempt to work out what stuff is in there. The one of these that gives the best results, usually is binwalk. 71            0x47            Copyright string: "Copyright (C) 2015 Retro Computers Limited." 579           0x243           Copyright string: "Copyright (C) 2015 Retro Computers Limited." This is sort of helpful; but not really – a copyright string that I could’ve guessed and some references to compressed Spectrum games. The Sinclair ZX Spectrum Vega. Copyright (C) 2015 Retro Computers Limited. This is more useful: we have some comments, a version number (0.1.64.20150909) and what look like chunk headers (VEGA, SMEM, STMP). We’ll come back to these later. Now that’s useful – that’s the header for a FAT16 volume made by mkdosfs. As this is a filing system we should be able to rip it out and mount it through loopback. In red I’ve highlighted the end of field markers and in blue the end of line. So presumably the firmware would expand in size dependent on games. 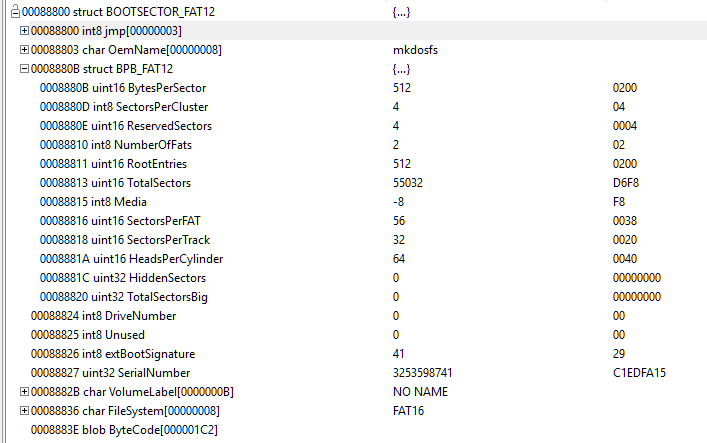 Right, we’ve decoded the lion’s share of the firmware, what about the rest? 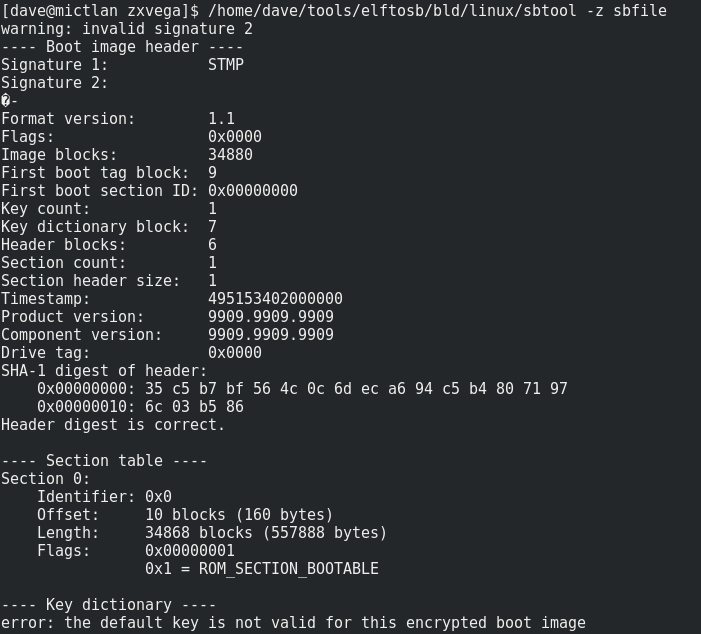 The STMP is a big clue of where the file format comes from and we can find a binary definition at rockbox of all places! There’s a copy of the tool, elf2sb that can be found on github. There’s also documentation at nxp.com. Using the rockbox link we can decode the STMP chunk, starting at 0x2f6; where the word block is used below, these refer to 16 bytes blocks. 0x0C 4 u32 0x00000001 Flags; bit 0 is bootable. If you’ve kept track of the sizes you can see they’re all roughly correct indicating that we’re interpreting this correctly. After this we have the DEK block – a block of Data Encryption Keys; each of the DEKs are encrypted with the KEK – the Key Encryption Key. And that’s our problem – we don’t know the KEK. Bugger. According to the Rockbox documentation it uses AES-128 in CBC mode to encrypt the DEK with a KEK passed on the command line. We’ve hit a wall with the firmware here, unless we can brute force the key (128 bits – that’s 3.4028236692093846346337460743177e+38 different combinations – that’s not happening any times soon) or we can look into using side channel mechanisms (maybe more on that later). It’s time to look at the hardware.